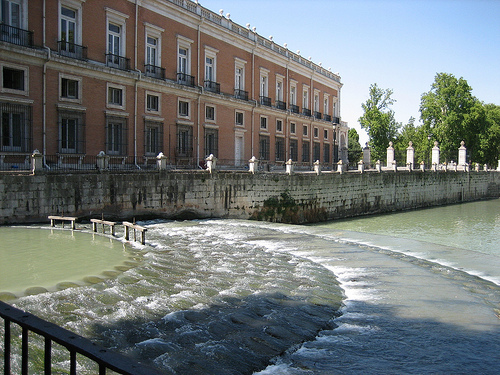 The Royal Palace of Aranjuez stands beside the rivers Tagus and Jarama in the province of Madrid, 47 km south of the capital. The palace was intended as a spring and summer residence for the royal family and is renowned for its gardens and fountains. 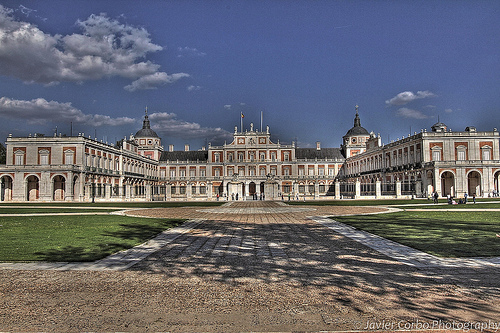 The summer residence built at Aranjuez in 1387 by Lorenzo Suárez de Figueroa, Grand Master of the Order of Santiago, became royal property under Ferdinand II, King of Aragon, and Isabella, Queen of Castile and León. In the reign of Charles V improvements were carried out by Luis de Vega (from 1537) and the palace was extensively enlarged by Philip II. The Aranjuez chapel was designed by Juan Bautista de Toledo and completed byJerónimo Gili and Juan de Herrera. 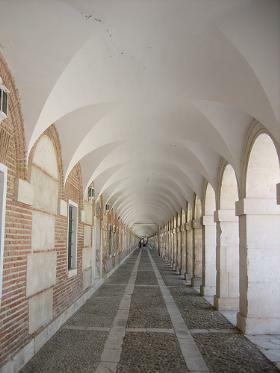 Palace of Aranjuez was built in a combination of white stone from Colmenar de Oreja and brick, giving a two-toned effect that was adopted for the rest of the palace. In 1571 work began on the cuarto nuevo, as the new palace was described, beside the chapel. The materials and mouldings of thepalace were similar to those of the chapel. The ground-plan of the palace was square, with a square central courtyard, but the lack of towers with pinnacles at each corner, more usual at this date, gave the building a more classical appearance. The principal façade was elongated by wings, and at the end of one stands the chapel. This meant that the more usual plan of a block with four equal sides was replaced in favour of a design with one principal block, an emphasis that was to acquire greater importance with successive renovations. The separate Casa de Oficios, quarters for the courtiers and servants, was begun in 1577 after the design of Herrera, and the angled forms and sense of volume characteristic of his style are seen in the order of the cloister. Aranjuez Palace as planned in the 16th century was not completed. 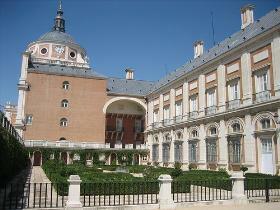 From 1715, under Philip V, a north wing was added by Pedro Caro Idogro. Giacomo Bonavia was commissioned to rebuild the palace, which had been damaged by fire, and restore the town. He was responsible for the vestibule, the great imperial staircase and the main façade (1744), in the centre of which is a portico surmounted by the ceremonial balcony of honour. Bonavia added a third storey and the frontispiece that gave weight to the main entrance. 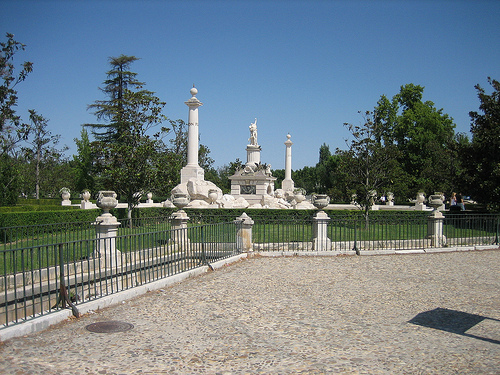 The statues on the balustrade of Philip II, Philip V and Ferdinand VI by Pedro Martinengo were added in 1752. The general style of this façade, combining designs that are both French and Italian, can be associated with that of the Spanish Bourbons. 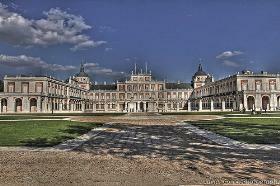 The Aranjuez Palace was enlarged under Charles III in order to meet the increasingly elaborate etiquette of the court. Two wings at right angles to the main façade, forming a U-shaped entrance courtyard in the French manner, were added by Francesco Sabbatini (wings dated 1772 and 1777). 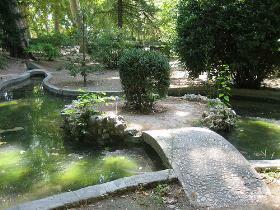 The gardens at Aranjuez are among the most important in Spain. 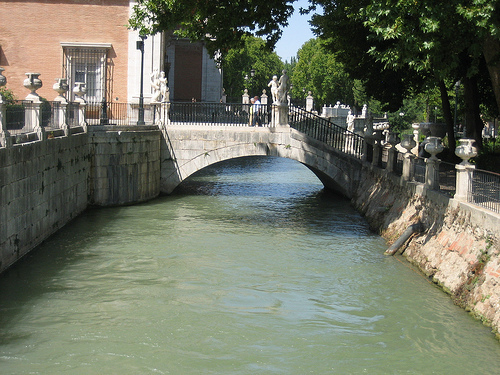 They were first created by Philip II and their continued development was made possible by the plentiful supply of water. An initial design was made by Juan Bautista de Toledo in 1560, but Herrera carried out the planning. Philip II first created a garden behind the main façade, ornamented with busts of Roman emperors. 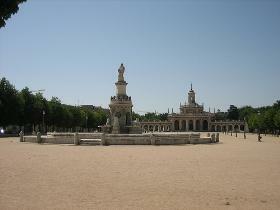 The Flemish naturalist Juan Holveque was employed from 1561 for the planting, and fountains were imported from Italy, such as that of Venus (1571). Conservatories, for example the Casa de los Naranjos (1571), were also built after the design of Herrera. From 1660 the design of the gardens was modified by Sebastián de Herrera Barnuevo. 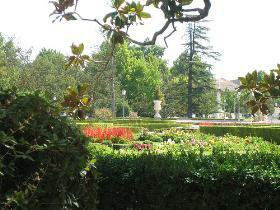 Among the garden fountains, some incorporated musical devices, others delighted with surprisingly devised waterworks. 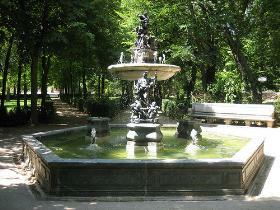 The fountain of Hercules and the Hydra (1661) was by Martinio Regio; that of Trypolemus (sculptor unknown) was set in the Jardín de la Isla (designed by Herrera Barnuevo, 1669). 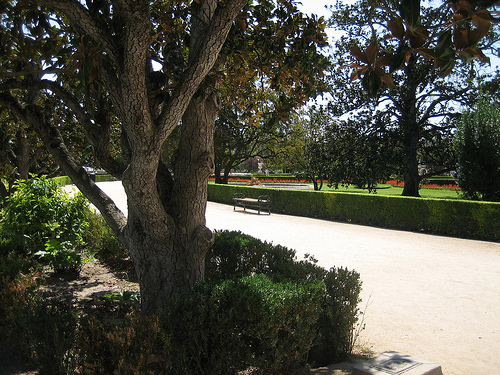 The planning of the Jardín del Príncipe was initiated by Ferdinand VI in 1750, but it was officially founded in 1772 under Charles III (plan dated 1784). 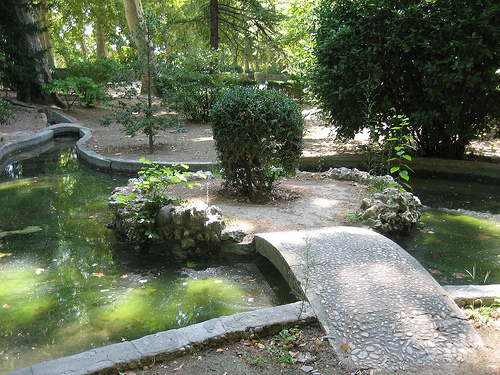 It is the largest garden at Aranjuez, sited with an attractive wharf beside the Tagus, and was designed, as were the pavilions, by Juan de Villanueva. This informal garden, with fountains and statues, incuding the fountain of Narcissus built between 1789 and 1795 by Joaquín Dumandré, surrounds the Casa del Labrador, which was begun in the reign of Charles III and completed (under Charles IV by Villanueva. The Casa del Labrador, decorated under Charles IV in Neo-classical style, was conceived in the same spirit as the Petit Trianon at Versailles, a retreat for the heirs to the throne, the Princes of the Asturias. 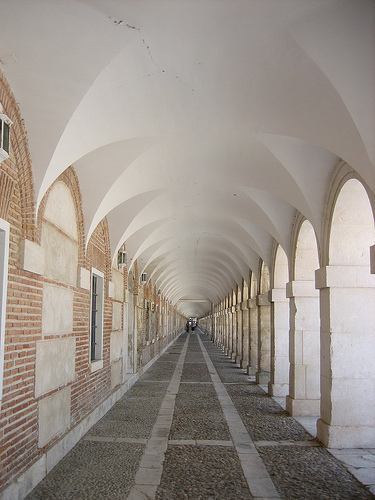 The interior of Aranjuez was adorned during the 18th century with a considerable collection of paintings, statues, furniture, mirrors and chandeliers. One of the most decorative rooms is the Gabinete de la Porcelana, which was sumptuously decorated in the Japanese style for Charles III with plaques of porcelain made in the Fábrica del Buen Retiro by Giuseppe Gricci of Naples. Since the reign of Philip II only those belonging to the royal household had been allowed to reside at Aranjuez. Under Ferdinand VI, therefore, a town adjacent to the palace was laid out on a perfectly regular plan designed and executed by Bonavia. 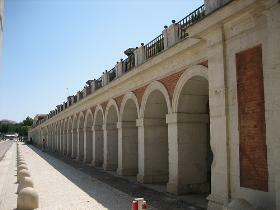 A triple avenue extends the axis of the gardens in a design resembling the trident at Versailles. 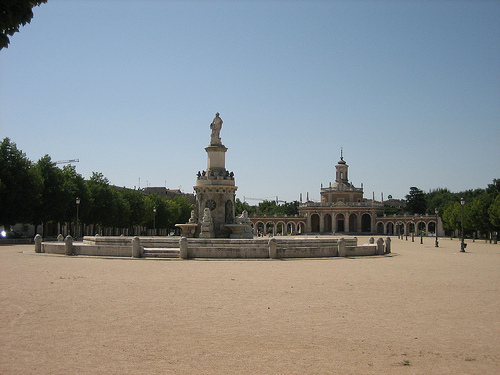 The Plaza de S Antonio was aligned with the avenue, and to the south stands the church of S Antonio (plan by Bonavia, 1748), linked to the palace by a long covered passageway of a type often used in Spanish urban planning. The Aranjuez church has a circular plan, and a tribune for the royal family, thus allowing the public some proximity to the monarch.